Much recognized for his global humanitarian efforts as he is for his accomplishments in the entertainment industry, George Clooney delves into untapped psyche as he takes on parenting in “The Descendants” with naturally gifted young actresses Shailene Woodley and Amara Miller. Directed by Alexander Payne best known for his work in “Sideways,” “The Descendants” is a man’s tumultuous awakening that might be awkward, comical and sometimes absurd, but nevertheless changes his concept of love, fatherhood and what it truly takes to be a man. 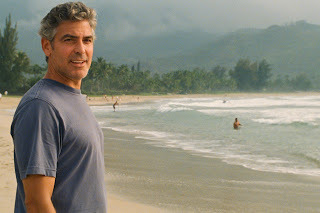 George Clooney stars as Matt King, a privileged Honolulu attorney from a landowning family who is compelled to reevaluate his marriage and life, while his wife lies comatose in a hospital bed following a boating accident. His mischievous daughters don’t trust him, his imperiled wife has been cheating on him and his broke cousins see him and the land trust he controls as a piggy bank. To add insult to injury, he’s surrounded by a lush, fertile, awe-inspiring landscape that defies his inner turmoil. Hemmings created Matt to reflect a distinct subset of the Hawaiian populace, a generation who trace their births back to the intermarriages of white missionaries and landowners with native Hawaiian royalty and their wealth back to the spoils of the colonial Hawaiian plantation system. As Matt explains, his great-great-grandmother was Princess Margaret Ke’alohilani, one of the last direct descendants of King Kamehameha, who fell in love with her haole (Hawaiian for white or foreign) banker, Edward King, leading to Matt’s current life as a Honolulu lawyer with deep, tangled roots in the islands. Like many Hawaiians, he is a hapa-haole, or half-white, who has never quite come to terms with his cultural identity. “I think it’s a coming of age film but the guy who’s coming of age is a 50 year old guy. He’s woken up to the fact that all of these betrayals that he feels – from his wife, to his children not really being great kids, to the fact that he has to handle all of these land issues, to the fact that he’s the only adult in terms of his family and his cousin – he’s as responsible as anyone else for being there. Then it comes down to forgiving yourself. That was a big part of the film, watching this quiet man,” Clooney says of his character. Clooney on the other hand lavishly comments on the screenplay (written by Jim Rash, Nat Faxon and Alexander Payne) and how it helped him prepare to be Matt King. “I wish I could say I got there 10 days beforehand. I wish I could say I hung out with all these descendants. But the truth is the screenplay did everything I needed. I did some research, I met with the people. I did some of that stuff. People work many different ways. I’m that actor that says ‘Today we go to work and this is what we’re gonna do’ and I leave that at the soundstage or the location when I’m done. And I go about the rest of my life. I have an on and off switch. Where the director helps is with the question, ‘At what level do you want this played?’ Because this is a tricky film to pitch. Pieces of it are almost slapstick funny: running down the street trying to have a dorky run, hiding behind a hedge and popping your head up, that kind of stuff. Then there’s stuff that’s very delicate and very careful and finding how to get there quietly, finding how to get there without much, without seeing the machinery working. A good screenplay does that and a good director does that,” Clooney shares. 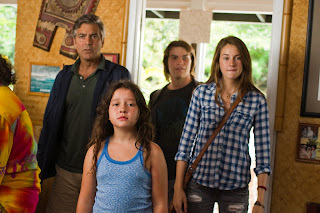 “The Descendants” opens February 15 in theaters from 20th Century Fox to be distributed by Warner Bros.